Do you know how to create a job board website from scratch and what you need to keep in mind before starting to put money in making this idea real? Even if you think you have thought through every single detail, there is a big chance that this article has something you missed. Hosting job advertisements may seem like an easy thing to do, but to make your online platform popular you need to fill it with handy features to become the first choice of companies seeking new employees and people seeking new jobs. So, read these ten things below to be sure you have information on how to build a job search website that would be helpful for its users and financially rewarding for you. Research is the first thing you need to do after you’ve come up a business idea. To know how to create a job board website, you need to know if you want to make it general or narrow it to a certain niche. Both ways are good, because making your job board platform general will bring you more companies and visitors, while making it niche specific will increase your conversion, because content on your website would attract people interested in this business area. In case if you choose niche targeting, research and analyze few niches to see if the one you’ve picked is worthy of spending your time and money. Like any other business areas, the job market has its trends that may or may not change. 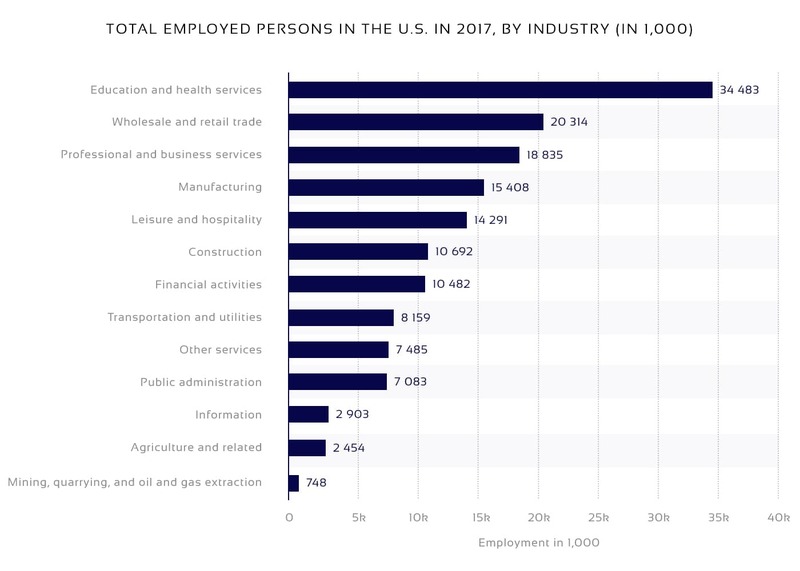 For example, according to the Statista service, in 2017, the highest employment rate went to Education and Healthcare industries with 34.483 employed people in the U.S. Wholesale and Retail Trade business fields were on the second place with the total number of 20.314 employed persons in the same country and period. 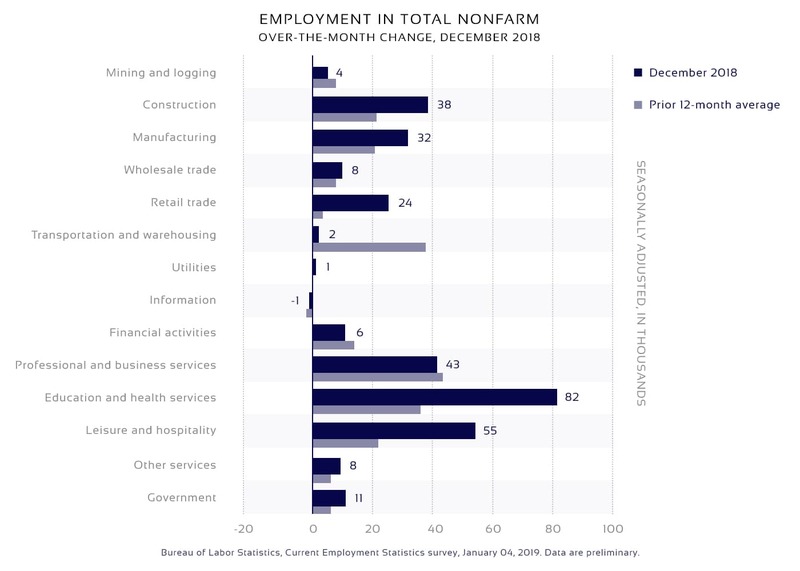 However, in 2018 there were some changes in the labor market. According to the U.S. Bureau of Labor Statistics, by December 2018, Education and Health Services officially employed 82.000 individuals, which made these fields stay on the first place. The second largest employment rate went to Leisure and Hospitality business fields with 55.000 people, while Wholesale and Retail Trade is no longer on top, even though their own employment rate increased up to 32.000. Create a job board site that will be flexible to changes on the labor market and your platform will always stay a top interest priority among those who want to get a job and the ones who want to find good-quality specialists. The name of your job board and your domain must be as similar as possible. Thus, when you’re picking a perfect name for your project, check fitting domains on availability to make a job board website memorable. Of course, you better get ready for seeing that all most accessible domains on the listings are either already taken or cost thousands of dollars. However, there’s nothing to get upset about, because these are the times when internet users appreciate creative ideas and content. What is most important, your domain and name must be informative, catchy and easy to remember. Once you include all these compounds into your name, it will increase and strengthen your competitive advantage on the market. You may be a genius in your business area, but if you’re not engaged into software development, you better leave this part of your idea implementation to professionals. The IT field constantly grows and updates, thus, tools and technologies widely used one or two years ago may be entirely replaced with the new ones in the nearest future. Software development experts always keep their eye on news in their field and have enough experience to determine whether the project requires new technology or a traditional one. Making a recruitment website may not be a highly complicated task, but it requires enough experience, knowledge and skills to make it most user-friendly and bugless. Basing on what functionality and features you want to add to your job board platform you need to develop its back-end and front-end sides using hands of professionals. The information technology field offers a lot more advances than few years ago. Artificial Intelligence and machine learning are now widely used for all kinds of websites that include live chat support. If you want to develop a job search website with chatbots, you can check out this Case Study page to get more information on this topic, and if you like what you see, you are welcome to choose our team to work on your project. We could write here information on how much time it takes to develop a new recruitment website, but instead of listing a blurry from-till development periods here, we suggest to clarify time-frames for the implementation of your website and/or application with the team that will do the actual development. The development speed will depend on the number of specialists who create a job board website for you, and, of course, on their skills and experience. The same amount of tasks may be finished within days by a professional and within weeks by someone less experienced. 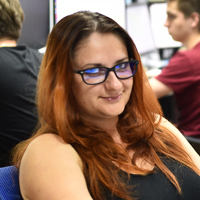 So, you need to keep this in mind when it’s time to choose the development team. Your functionality logics must be flawless to ensure best user experience, and thus, more loyal clients. In case if your job board platform has only its primary functionality, you will have two main types of guests - companies that seek new employees and people who seek new job. Since users will have personal profiles you need to develop advanced dashboard functionality with the set of features that will help them to easily get access to required information on their previous actions and transactions. All these features may not guarantee that visitors will have the best user experience on your website ever, but they will make it most attractive to use your job board on a regular basis. There are many ways to monetize your job board platform, but it wouldn’t hurt your project to decide which ones would be most efficient for you. - Memberships.You can implement a membership system for both companies and job seekers. Depending on what membership pack a company buys, it can have different amount of information to place on your platform such as number of open vacancies, extended description, surveys, etc. Membership for job seekers may also be advantageous if managed wisely. For example, the most expensive membership pack may give people an 24-hour opportunity to see new vacancies before individuals who bought less expensive ones can view them. - Paid advertising.This kind of website monetization must be handled very carefully, because irrelevant ads always irritate and distract users. You can offer companies that place their vacancies on your platform to advertise their services at a discount. Promo banners, popups, video ads and other widely used forms of advertising may bring you additional income on a regular basis. - Blog articles with sponsored content. Today, SEO is one of the top service promotional tools and you may additionally benefit from knowing it. If you intend to add blog to your job board platform, you can include articles that directly promote your clients. However, in order not to lose trust of your loyal clients and blog readers, you need to label such articles to give them an opportunity to decide whether they want to read this content or not. or other events that need to be advertised to attract more interest and increase number of participants, you can give them an opportunity to reach out to their target audience using your job board site. Today, just starting a job board website is not enough to succeed in business rivalry. Thus, it is important for your job board platform to be at least mobile-friendly. However, if you get an additional application with same functionality to install it on mobile devices, it will contribute to your competitiveness and success. Since more people check their news and mail using smartphones instead of personal computers, by having a mobile app you will cover bigger audience and help more people to get a job they seek. If you don’t know what stack of tools and technologies you need for making your job board reach out to smartphone users, you can contact our development specialists to get their professional assistance. By making your job board service multi-language you’ll be able to cover bigger audience, including companies and job seekers from other countries. Even though if you do not intend to go international right from the start, it wouldn’t hurt to design and develop your system so it would be flexible to adding more languages in the future. In case if you’re wondering how to start a job board that would be international you must know that you’ll need not just text translation, but content localization that handles spelling or date writing differences, etc. Business world can be tough and it means that you must always be aware of what your main or potential business competitors have in mind and on their job boards. In fact, the answer to the question “how to start a job search website?” lies in deep research and analysis of your competitors. With the help of valuable information on their past and present performance you’ll be able to avoid some common mistakes like ineffective business plan, wrong media channels for promotion, unsuitable design theme, etc. To develop an effective marketing campaign, you need to know what trends and ideas your competitors are using at the moment and what themes they cover in their blogs and social media pages. We hope this article gave you useful insights on how to create a job search website and make it profitable. Once you do the research and analysis of previous and current trends on the market, you’ll be able to develop a detailed plan that covers every step of turning your idea into a real product. It is important to stick to this plan if you want to finish it successfully and right on time. The job board platform development process is one of the most important, because its quality and your success are tightly connected to each other. Before promoting your service, you must know that it is of the high quality and there are no malfunctions on back-end and front-end sides. When choosing a team who will create your website and/or application, you better pick the one that has a QA engineer for obvious reasons. Also, it would be wise to hire not just a web designer, but a UI/UX expert, because today, good user experience is more important than just an eye-pleasing interface. Our web and mobile specialists offer a wide range of development and testing services, so contact us if you want to be sure that your job board website is of the highest quality and financially profitable. Did you enjoy reading this article? Please rate it with one of the buttons below to give us insights on its quality, so we know if the article is good or needs some improvement. Get new articles to your email every Thursday!